Last edited by lermanet_com on Tue Jul 24, 2007 8:43 pm, edited 3 times in total. I had heard long ago about Manson's supposed dealings with the Process - which was apparently a Scientology offshoot/hybrid. Do you have any documentation in regards to his involvement with that? If there was an e-meter at the Spahn ranch, it's possible to identify the owner by the serial number on the meter. Chances are it was a stolen meter. I had heard long ago about Manson's supposed dealings with the Process - which was a Scientology offshoot. Do you have any documentation linking to that? Ive got a lot old news article about the process church and charlie manson, that I havent webbed yet.. I was just sitting down this evening to read Peter Lavenda's book and relax, and I just started reading the Forward and then went back to my computer and cranked up my .htm editor to update the Manson page immediately. "one of his teachers said that, with Scientology, Charlie's ability to psych people out quickly was intensified so he could zero in on their weaknesses and fears immediately. Thus one more method was now stored in his manipulation tool chest"
I am curled up on the couch reading this book, i think it's worth other people buying too, especially because the author was sued by Scientology for the nine words I placed in the topic subhead. I'll be adding Lavenda's entry to the Scientology litigation for silence page tommarro. I'm picking that up tomorrow, along with BarefacedMessiah. SuzanneMarie wrote: If there was an e-meter at the Spahn ranch, it's possible to identify the owner by the serial number on the meter. Oh go tell Sylvia Stanard to go get some rest, okay, suzanne? There is nothing you can do, Scientology dropped the lawsuit, would you like to sue me? oops, you guys already did that..
Nou will have to spam the whole chatboard to move this topic off the front page. I dont trust those guys any more than I trust Gordon Melton's opines, I consider them apologists see what they say about Scientology! I have exiting scientologists read Victor Frankl's "Mans search for meaning"
And Dusty Sklar! read her book Gods and Beasts - The Nazi's and the Occult..
the techniques hubbard uses to sell scientology are right out of what worked back then, Dusty Sklar was sued for the last chapter whichw as about the Moonies... she did not know about Scientology ( because att he time, Paulette Cooper's book was in litigation etc ) after she found out about scientology, she told Paullette that had she known about them, she would have used SCIENTOLOGY for the last chapter of Gods and Beasts for the chilling contemporary paralells..
Manson had very little to do with Scientology but any nutcase (like Manson) could claim this. I am no apologist for CofS (to say the least) but using Manson's notorious character is not a good thing. Scientology did not make Manson into the way he was. Having grown up in reform schools, and penitentiaries, he was trained by professional criminal minds, I bet his insight made it instantly apparant to Charles Manson, that Scientology was a useful tool to control minds. He valued it so much he acquired a scientology e-meter...so he could practice scientology tech. What cannot be debated is that there was something in Scientology that a serial killer criminal mind found very appealing, useful.. it was a useful TOOL that empowered him, and made him capable of not just being a lone monster like Jeffery Dahlmer, but one who was able to create a group that would follow his every instruction and go out and do exactly what they had told them to do. Last edited by lermanet_com on Sat Aug 12, 2006 6:34 am, edited 1 time in total. murder of two Scientologists was also very possibly Manson's work. Here's a post with the Helter Skelter stuff. name, but I haven't seen it.). errors are mine unless otherwise noted with a [sic]. Scientology, becoming a "theta" which Manson defined as being "clear". Manson's involvement with Scientology had veen more than a passing fad. "Oh, go tell Sylvia Stanard to get some rest, OK, Suzanne?" Go tell her yourself, you hoople, you've met her, I have not. So whose e-meter was at the Spahn ranch, Arnie? Don't know? Contact the people who do silver certification on meters and give them the serial number. Inquiring minds want to know why are you covering up this piece of vital data. WHOAH! Doesnt the subject of Manson get them Scientolobots goin? Not because Manson wasnt confirmed as having 'services' in the BigHouse, but because it's yet another dirty little secret Scientology wants hidden. Dear Mary Sue, COMPLIANCE REPORT RE: MANSON, BRUCE DAVIS There have been numerous new developments on this case and they are as follows. An individual by the name of Steve Grogen appeared on our lines (PM). I received word that he had made statements that he was a member of Mansons family and therefore started some intell. action, which at first consisted of talking to the girls he had been in contact with. By the time I had finished talking to them Grogen had been put away in jail for car theft. In spite of numerous efforts on our part it was impossible to get together with him. I had the girl he seemed to be most in comm with, journey out to the valley on four different occasions to talk to him and in spite of our best efforts he was never made available. He was either "in court" or the jail was undergoing extensive re- decoration. Of course we did not want it known that a member of The Church was trying to see him. At the same time this was going on we received word that two members of the Manson Family "squeeky Frome" and "Sandy Goode" were staying at the Viking Motel on 3rd and Alverado which is in close proximity to the org. We made no efforts to contactthem. According to Raul: Raul arrived in prison on McNeil Island, Washington in 1962 and became a cell mate of Lafayette Raimer allegedly a trained Scientology auditor (about Level I in Raul's estimation) and was introduced to Scientology at that time. Raimer was auditing in prison at that time and in one 10 man cell had managed to gather a group of about 7, all in Scientology. Charles Manson entered later and studied, did TRO etc. along with his cell-mates and received approximately 150 hours of auditing from Raimer. Processes used were CCH's, Help processes (Who have you helped-Who have you not helped) and other Dichotomy processes (Rauls terms, such as What can you confront, what would you rather not confront), Havingness (Such as "What can you have?" "Look around and find something you can have. Look around and find something you're not in." Rainer kept recor records of his auditing. Manson got super-energetic & flipped out when he'd been audited and would, for a time, talk about nothing but Scientology to the extent that people avoided his company. After a while, however, Manson was screaming to get away from his auditor (in Raul's opinion, he'd been severely over-run or something). He eventually managed to get put in solitary confi- nement to get away from his auditor. Eventually prison officials got suspicious of the groups strange activities and broke up the group. Subsequently, Raul was released from the prison in 1965. Subject: More on Charles Manson as a Scientologist. From Bugliosi HELTER SKELTER -- page 647 On November 21, 1969, the bodies of James Sharp, fiften, and Dorren Gaul, nineteen, were found in an alley in downtown Los Angeles. The two teen-agers had been killed elsewhere with a long-bladed kniife or bayonet, then dumped there. Each had been stabbed over fifty times. Ramparts division Leiutenant Earl Deemer investigated the Sharp-Gaul murders, as did Los Angeles Times reporter Cohen. Although the two men felt there was a good possibility that a Familty member was involved in the slayings, the murders remain unsolved. Both James Sharp and Doreen Gaul were Scientologists, the latter a Scientology "clear" who had been residing in a Church of Scientology house. According to unconfirmed reports, Doreen Gaul was a former girl friend of Manson Family member Bruce Davis, himself an ex-Scientologist. From Paulette Cooper THE SCANDAL OF SCIENTOLOGY p105 Another bit of publicity that the Scientologists are probably not too pleased with concerns the murder of three people in Los Angeles. Two were Scientologists. According to *The New York Post*, all three were brutal- ly beaten, ritualistically stabbed, had their right eyes cut out, and were dumped 100 yards from a Scientology commune. One of the girls, Miss Doreen Gaul, nine- teen, who came from New York to study Scientology, was naked except for a strand of Indian beads. The boy, James Sharpe was fifteen years old. The third was un- identified. Doreen Gaul's father allegedly told a *New York Post* reporter that she had lately become disen- chanted with Scientology. Scientology played an important part in the lives of Charles Manson and Bruce Davis. 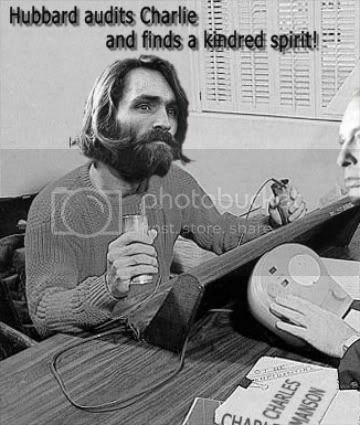 There is documented evidence regarding the teachings of Scientology to Manson even while he was incarcerated during the 1950's. It is reported Charles Manson reached the level "Clear" and was rather astute in his adaptation of control and manipulation techniques when dealing with other people. Manson used Scientology to answer questions with Diane Sawyer during the ABC television broadcast. Manson often expressed the concept of living in the "Now" and that term was used to describe the murder of Shorty Shea, when the killers said "It was hard to bring Shorty to Now". Bruce Davis was an emissary for Manson when he traveled to England to work out problems between The Process and Scientology. Davis denied to the BBC reporter Bill Murphy that he ever traveled to Manchester England, despite the fact witnesses saw him there. Murphy had an acquaintance who actually witnessed Bruce Davis traveling around Manchester with a coven of witches. Murder victims Doreen Gaul and James Sharp were deeply involved in the Church of Scientology and it was documented James Sharp conducted instruction to Doreen Gaul the night of her murder. He was taking Ms. Gaul to the level "Clear" and Gaul was also working on Engrams at the time of her murder. Bruce Davis lived in the same communal residence as Doreen Gaul while he was very active in Scientology. The owner of the residence was The Church of Scientology. Just prior to the murder of Doreen Gaul, she made a telephone call to her father asking for an airplane ticket home. Mr. Gaul told Doreen he would send her a round trip ticket. She responded that it should be a one way ticket. Said Gaul to her father, "I think this stuff is all a bunch of crap." She was leaving the Church of Scientology and that fact was documented by a friend of Doreen Gaul who resided in New York who had offered her a job. For whatever reason, The Church of Scientology has played a very important part in the Manson saga. The Church of Scientology even offered a reward for the arrest and conviction of the person/persons responsible for the murder of Doreen Gaul and James Sharp. Susan Atkins stated that a "man" use to come up to Golar Wash and have meetings with Manson. "I believe he was with The Church of Scientology" said Atkins. Paul Crockett, Paul Watkins and other Manson family associates spoke of the influence of Scientology on Manson. Best Selling author Ed Sanders made some statements about Scientology and The Process Church in his first edition of THE FAMILY. Legal action caused Sanders to remove that portion of his book in the subsequent editions. Scientology is an important part of the Manson story.